This is a story of the cross I was given to bear in this lifetime - we all have one, right? I wrote this for ALL the people who were kind to me on my journey as I struggled. Who nurtured and loved me when my family was 3,000 miles away, after I moved across Canada for university. Who perhaps felt a little confused about this or that in our interactions, because I left too quick, or because you did. This is for you. I love you! Thank you! I've gained a bit of internet fame thanks to a whole bunch of 3's. First, after being slim my whole life, was the whole weighing 300 pounds thing. Yup, thirteen years ago, in 2004, I gained a whole extra person's weight on my body: I gained 150 pounds. My diagnosis of Post Traumatic Stress Disorder (PTSD) had left me comatose after working on a high profile murder case in my career, then between prescribed pharmaceuticals, over-eating, and immobility, THAT HAPPENED. I've yo-yo'd some in the past thirteen years since then, but this was by far the most extreme reaction to past trauma I've ever known. Next, was creating a $30,000 revenue week in my online coaching business, doing exactly what I love: helping women overcome challenges that I myself have struggled during my 42 years on planet earth. Last but not least, was changing addresses a total of 30 times, before even living a full three decades of moving-age life. Yeah, I'm masterful at what I do. I'm resilient AF, and I help my coaching clients and students to be too - with their body image, their relationships, their businesses, their money. and you'll feel joyful AF as you do it - but turning a house into a home? I mean, I'm good with the whole decorating thing, adding the warmth of a woman's touch to a house- but feeling grounded enough to stay in one place for longer than six months or a year at a time? That took a bit longer to master. People have judged me for it over the years, some thought something was severely wrong even, but there's always context for every situation, right? Some people actually choose Air B&B lifestyles, like popular millionaire author and comedian James Altucher, for example. For me, it was a subconscious pattern that kept running and running unbeknownst to me. I had no idea I had the power to change it - yet it's one of the biggest reasons I help women with mindset and life and business transformation now: it truly is just a pattern, and all patterns can be shifted. Here's how my particular pattern started . . . Growing up, school was my home. As far back as I can remember, I could not wait to get to school. Mama and Papa had their good years, but for the most part, Italian immigrant life in the 70s and 80s was not easy. Both my parents were born in Italy. Mama was 17 when she was plunked into a pre-arranged marriage to a thirty year old man. Language barriers, financial barriers, social barriers added even more pressure. Not to mention parenting two young children all the while. Stress was FULL ON in my childhood; unfortunately so was domestic violence. My parents relationship was volatile, so I've spent four decades learning how to live differently, in my own relationships, my business, and just how I see life, by myself. Still, there were good days amongst the dark ones in childhood. Mama often celebrated my love for school with me - both the academic and social aspects, by hosting UBER FUN sleepovers for my school friends with lots of dancing to popular albums, and pancake breakfasts. We even had a school dance in our giant fireplaced basement more than once - but at night, when it was just our family again, I would tuck my younger sister to sleep in the closet, just "in case." I'd cuddle her to sleep, hoping for the best, because there were so many horrific memories, I was terrified of being hurt. My father never struck us, even though he regularly attacked my mother, but I still didn't know if we'd make it through the night, or if we'd wake up with no mother at all. In the morning, life seemed to magically turn normal. Teachers at school became my parents. I felt close to them, safe with them. My classmates were like siblings that I could enjoy, without feeling responsible for, or worrying about. Those school walls were my safe zone. My growth zone. My thrive zone. With my root chakra needs being met there, I could laugh and learn and actually be a kid. At least until that end-of-the-day school bell rang. At thirteen years old, I was sent to a child psychologist when my parents divorced. That's when I was officially diagnosed with a type of PTSD known as "childhood" or "complex" or "developmental" (C-PTSD). In essence, it means PTSD that was prolonged, and therefore interrupted and impaired the person's usual course of human development. It felt good having someone to talk to about what was going on at home. I healed enough through that therapeutic relationship, that I was able to dream about the future a little, as most normal teens were doing - especially about finding a man to marry, and having a house and life of my own. When the football captain asked me to go steady, it felt like my dreams had come true over-night. We dated for eighteen months. I was convinced he was the one. I knew I would marry him. I liked his home, I felt safe there. We had so many friends together, our giant group of friends became our family. Parties, camping adventures, movie nights and lots and lots of card games (our favourite was Euchre). Never in a million years did I imagine he would assault me in the exact same way I had watched my mom be assualted all those years. It was not a regular thing. I was fifteen years old. It happened one time, then the relationship ended. Because I was a minor, the police ended our relationship right then and there, with mandatory filing of charges. It didn't matter that when I came to, after being knocked unconscious, that he was crying desperately on my chest, "Gina, I'm so sorry. Oh my God, what have I done." None of that mattered. My boyfriend had become dangerous, a criminal, overnight, and something inside of me - that part that dared to love after all I had witnessed growing up, went into hiding. This event sealed the deal for me. Every cell in my body was now 100% convinced that I would never feel safe in the world again, let alone in any kind of house or domicile that had walls to entrap you with terrorizing men who were supposed to love you. I stayed away from even entertaining the idea of having a boyfriend for seven years after that, and focussed on what I was good at: school and friend.! My grades soared. I was one of the rare students who received a scholarship to university, then regular As and even some A+ grades while I was there. Scholastic recognition and achievement always made me feel good. As did spending time with my fellow students, who often became good friends. Once again, as I did in elementary and secondary (high) school, I felt at home in the library. The gymnasium. The front lawn. Any-where to do with school. There isn't a perfect, happy ending here. So much growth and learning in relationships followed - and I'm still learning, always. What I can tell you, is properly processing the feelings associated with this decades-old trauma, made all the difference, and ultimately, allowed me to lay this pattern to rest. I now attract people in my life who take time time enough to understand why I was so sensitive, so jumpy, too touchy for prolonged intimacy when my PTSD was untreated. Why I sometimes feel safer in nature, with wildlife, than I do with human beings. To understand why home never felt safe to me, why I moved so much. Why I can sometimes flee at the first sign of trouble. Or eat too much food if there's no way to run. Why if someone raises their voice, or even becomes slightly conftrontational with me, my body would re-live my past experiences all over again, while my conscious mind had no understanding of what was happening. I'd feel so confused. I'd become overwhelmed and fast. My close friends and loved ones now validate me, with exactly what I need to hear: "That must be so scary. You must feel so confused. What a terrifying way to live!" I write this to you now, of course, from the treated side. 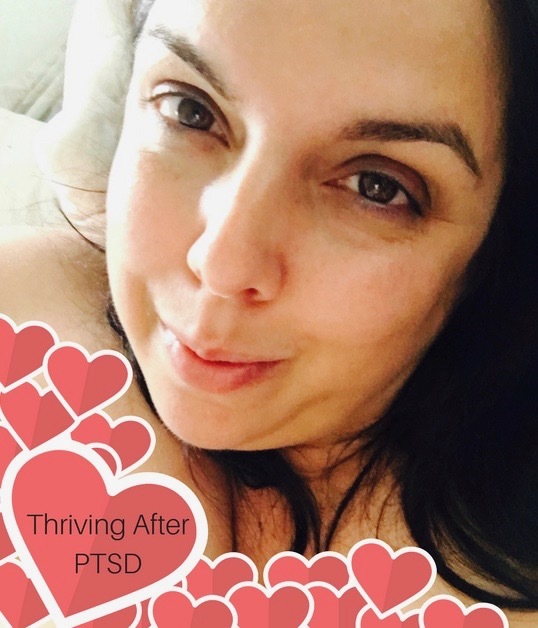 After years of healing and deep understanding of the impact of early trauma has had on me, at every level: physical, emotional, spritual and energetic. I've healed most of the debilitating C/PTSD side effects, but like I said in this article's intro, my intention in writing today has nothing to do with me at all. I'm writing this for you. So you know you're not alone. So you know what happened between us, if we were once connected and now we're not. So you can be there for someone who has C/PTSD too. Open up to learning and growing together. Beautiful healing and quality connections await, when you just let them. If that's not the true definition of success, I don't know what is.